If sleek lines and high-tech features appeal, consider this brand’s German-made kitchens, available in glossy laminates and luxury ceramics. Represented across the country, including in selected John Lewis stores, the flagship showroom is in Leeds. Experts in traditional country house kitchens, pantries and sculleries. Expect bespoke handcrafted designs made with the finest attention to detail – the company has experience working with Grade I-listed buildings. This DIY specialist has more than 300 showrooms and currently carries 13 price-friendly kitchen lines ranging from the traditional to the trend-led, which can be complemented by a variety of appliances. 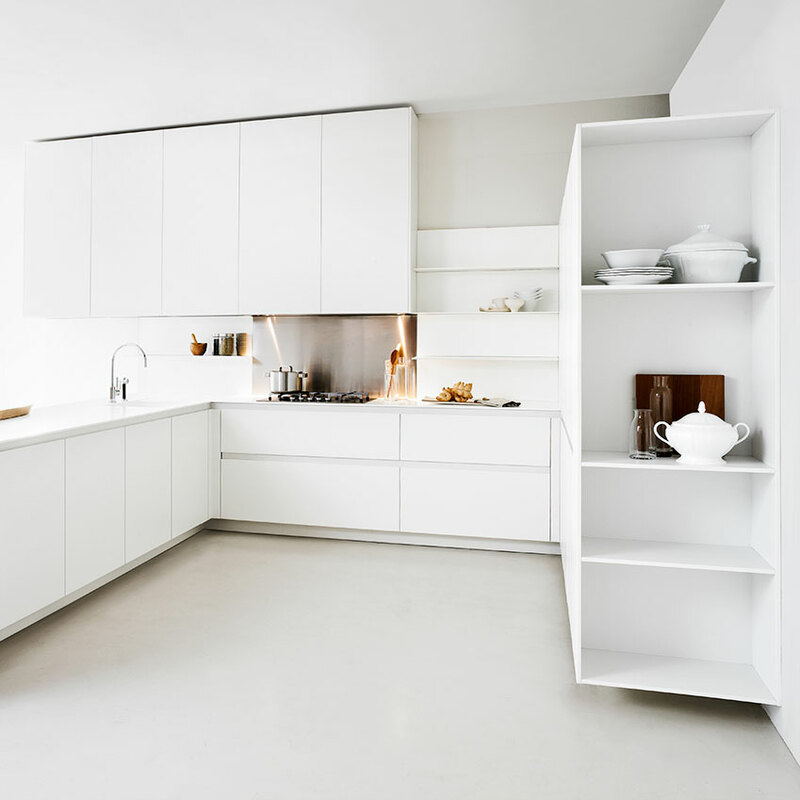 A good port of call for a basic white handleless kitchen. Master craftsman Damien Moura-Delort has created beautiful leather goods for major fashion houses such as Louis Vuitton and Kenzo, and has collaborated with the likes of Michael Kors and Marc Jacobs on designs. His company, Bespoke Leather, can make anything from luggage and bags to unique leather products for the home: handrails, knobs and handles, furniture and more. Founded by furniture designer James Blake, this company creates stylish kitchens using its own innovative design flourishes. Its first showroom opens in Wandsworth this summer. Until then, customers can view existing projects online. An Italian firm known for its super-chic kitchens and collaborations with big-name designers. Head to its main showroom in London’s Chelsea to get an early glimpse of the ‘Salinas’ modular kitchen by Patricia Urquiola, which has distinct black metal frames. The more affordable offshoot of traditional joiners Plain English. All of its products are made in Plain English’s workshop, but costs are kept down by not offering bespoke sizes, delivery or fitting. 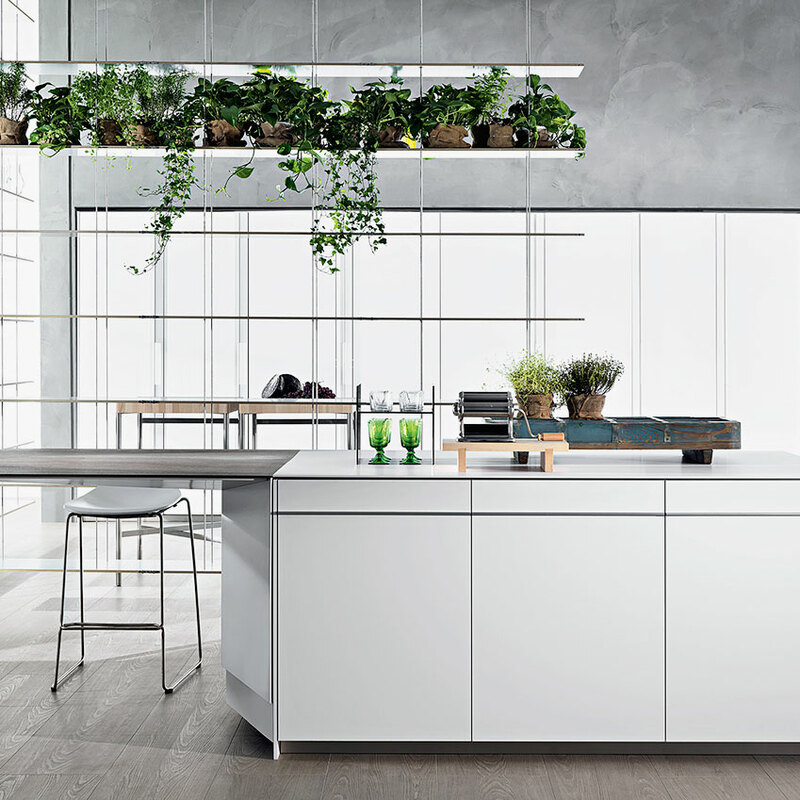 With three streamlined looks – the minimalist ‘b1’, workshop-inspired ‘b2’ and architecture-driven ‘b3’ – this high-end German brand sells slick kitchens for open-plan living. There are 14 UK stores that you can visit to get a feel for the brand’s modern aesthetic. in St Albans or a new space opening soon on London’s Wigmore Street. or painted finishes to choose from. 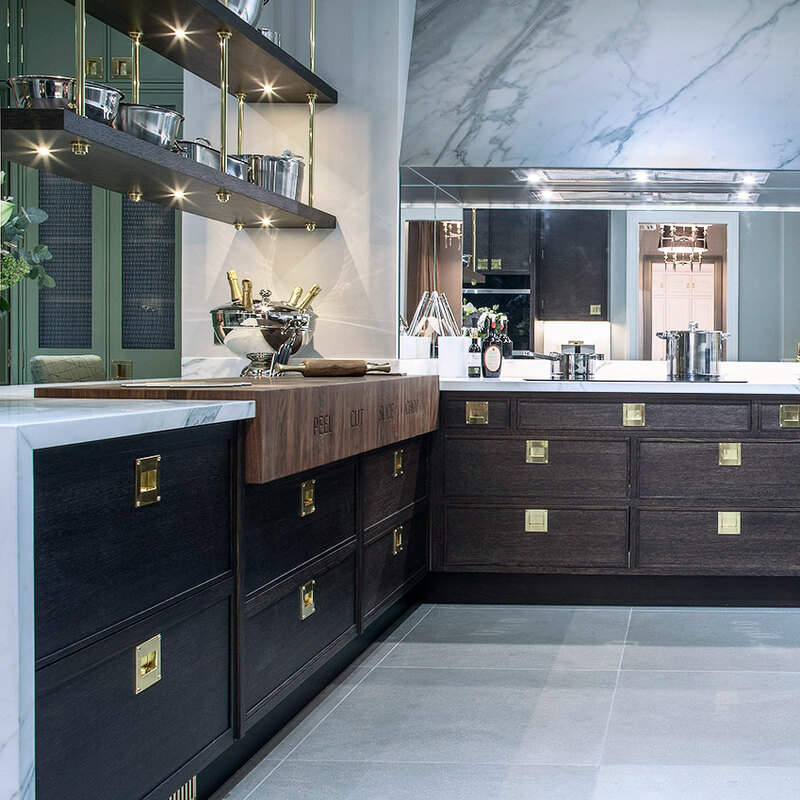 Classic and elegantly fitted cabinetry, crafted from rich woods and finished with fine hardware, is the speciality of this firm based in Connecticut, US – there’s a showroom at London’s Design Centre Chelsea Harbour. Fancy a tipple? The company can also create bespoke wine cellars and bars. An impressive range of stone-clad handleless kitchens with luxe details – such as hand-stitched leather cutlery inserts – will launch at the Kensington showroom in March. Prices are hefty, but customers have the chance to hand-select stone from Italy. German engineering is the theme at this London brand, which sells streamlined kitchens by Leicht and appliances by Miele, Siemens and Franke. A full design and installation service is offered. Visit the London showroom to marvel at designs by greats like Luca Meda and Rodolfo Dordoni. Want a real dream kitchen? Here you can mix and match elements from different models to create a truly original space. Davonport Bespoke cabinetry, from the traditional ‘Fallowfield’ through to the new handleless ‘Linear’ kitchen, which features beautifully soft curves, is created in this company’s Colchester workshop, next door to its showroom. Its designs are also sold through partner dealers across London and the South. This inspirational showroom reopens in a dramatic 370-square-metre space this month. Five kitchens from architectural brand Modulnova will be on show, alongside bathroom and living concepts. 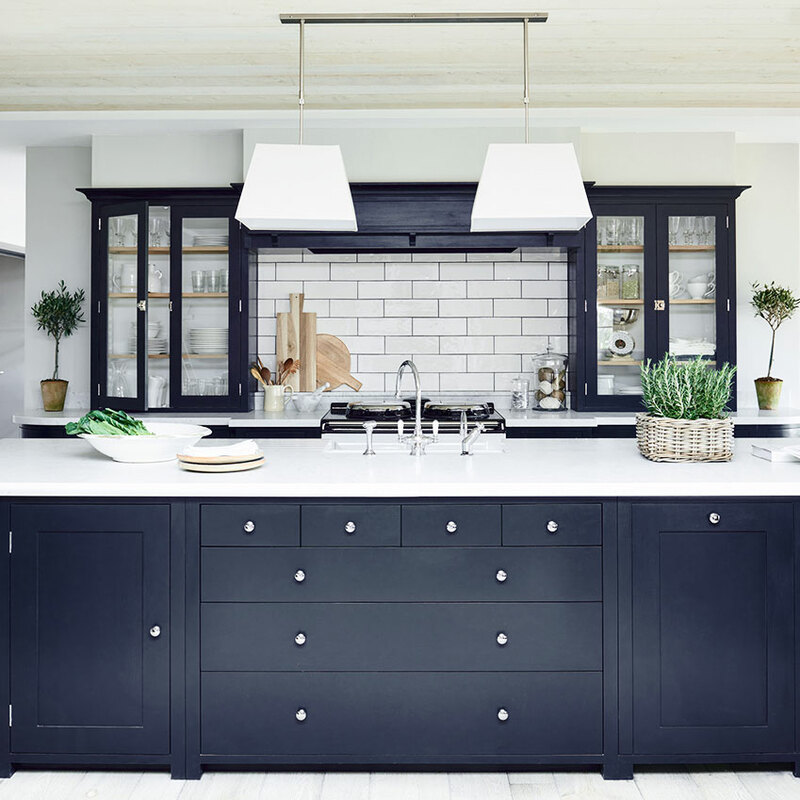 Devol Visit this company’s showrooms in Leicestershire and London to see the retro-style ‘Air’ and the latest kitchen by Sebastian Cox, which is crafted using sustainable British timber. You’ll also be tempted by Devol’s new range of ceramic tableware. 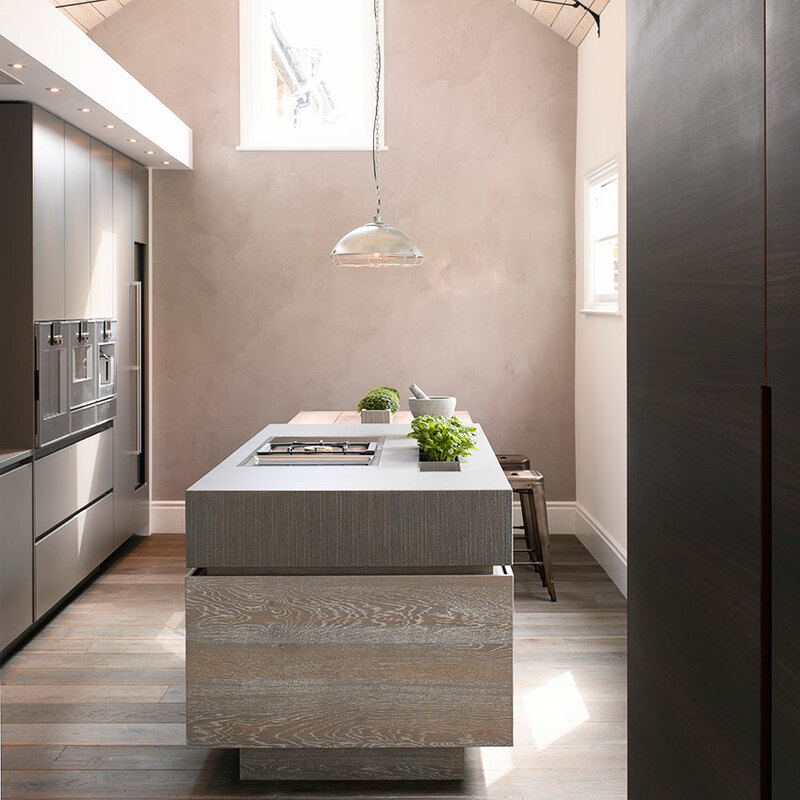 Located just off of Portobello Road in west London, this appointment-only trade showroom imports one-of-a-kind contemporary kitchens crafted from a mix of beautiful materials, such as stone and eucalyptus. They are all produced by luxury Spanish manufacturer Doca. 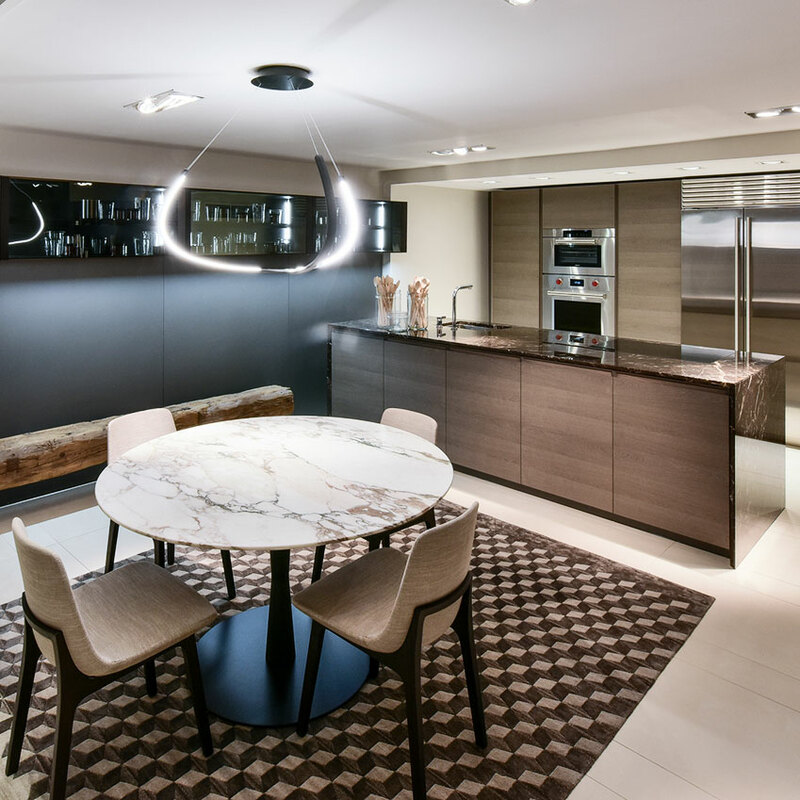 This modern Italian furniture company presents its collection of highly customisable kitchens, such as the bestselling ‘Opera’, in swish central London surroundings. Expect to find sleek, superbly functional entertaining spaces, created with Italian-made Cesar, Euromobil and Aster kitchens, plus cutting-edge Sub-Zero & Wolf appliances and dining furniture by Tonon. Visit the main showroom in Battersea or the brand’s new venue at London’s Design Centre Chelsea Harbour, opening in March. Extreme goes beyond just lifestyle or style requirements, with kitchen designs that are truly individual, created exclusively for each client. These are kitchens that capture the personalities, experiences and achievements of the client. It’s design with a story and meaning that’s just as special as the style and craftsmanship of the furniture. Fired Earth Beautiful fitted and freestanding kitchens to suit both period and modern homes are complemented by an excellent paint and tile collection. Ten of this brand’s 62 showrooms incorporate kitchen displays, including a new store in London’s Portman Square. 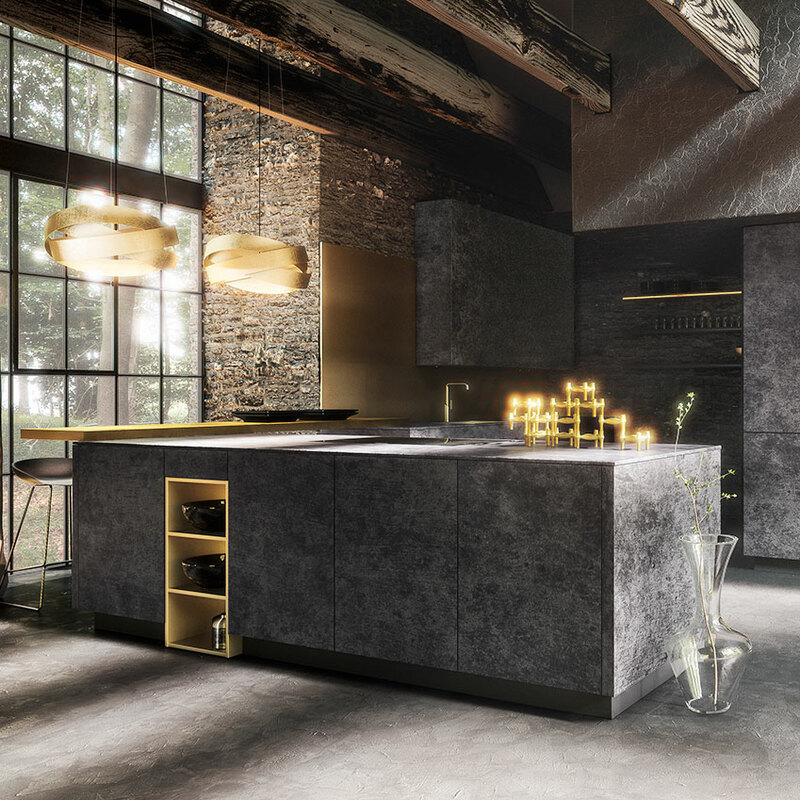 Discover Italian-made Scic and Fendi Casa kitchens at this showroom. The wow-factor comes from the use of decadent and unorthodox materials, such as leather-covered doors and beautiful rare woods. Habitat This high-street homeware store sells fitted kitchens in 30 different styles with over 55 handle options. A design studio at the Tottenham Court Road branch has 3D software to help you plan your space. Harvey Jones For over 35 years this company has been making its timeless ‘Shaker’, ‘Original’ and ‘Linear’ kitchens, which are primed ready to be painted any colour of your choosing. There are 31 showrooms nationwide, but visit the Guildford store for the largest range of inspirational kitchen sets. Mixing and matching materials such as sleek Corian, thick fossilised Belgian bluestone and reclaimed woods to create a bespoke design is this company’s business. Modular Schuller kitchens are also on display at the London showroom. 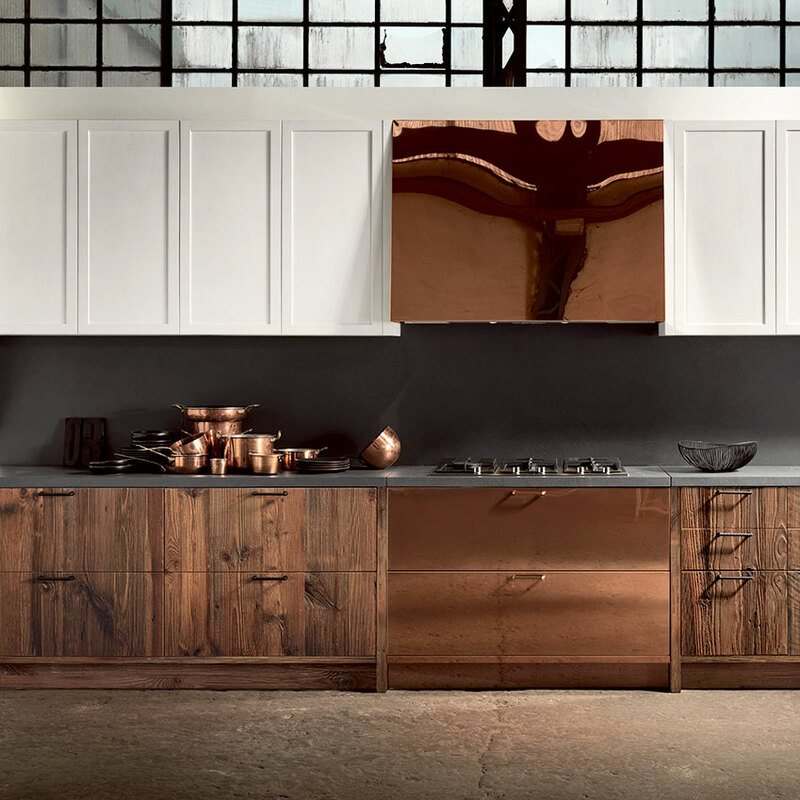 This east London showroom represents top-of-the-range kitchens by Cesar and is managing the exciting re-launch of established Italian brand Del Tongo in the UK. Look out for a new model by architect and furniture designer Giulio Cappellini. as the latest professional-grade appliances from Barazza, Falmec and Miele on display at this inspiring showroom in Battersea, south London. St Albans. Kitchens come with a lifetime guarantee on all workmanship. 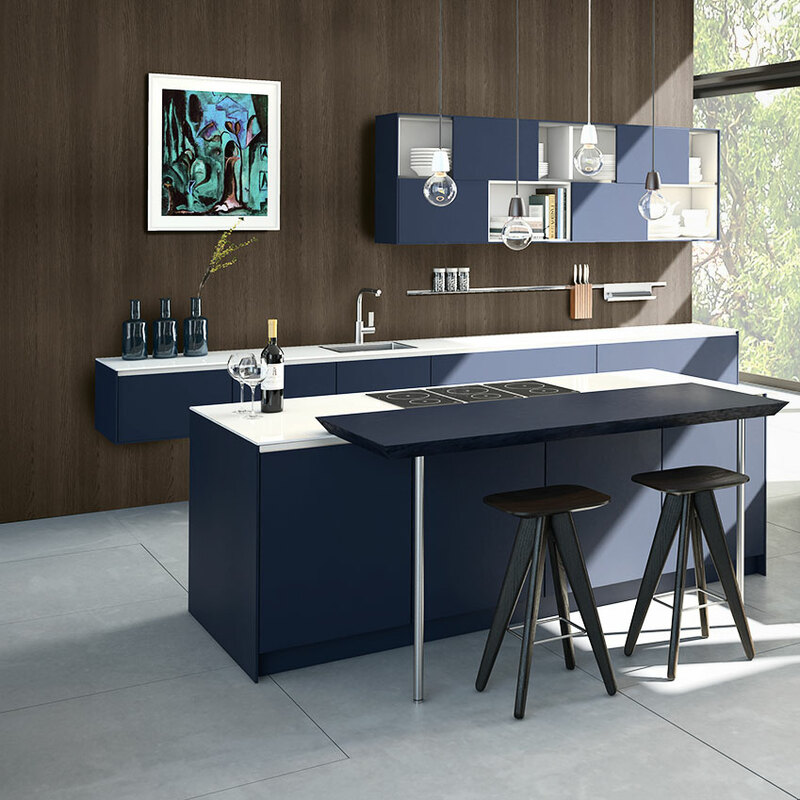 The brilliant modular ‘Metod’ kitchen can be easily updated with pre-cut or custom-made worktops and an ever-growing collection of door fronts: new designs include the walnut-effect ‘Voxtorp’ and ‘Marsta’, which has stylish groove handles. All kitchens carry a free 25-year guarantee. This London showroom is the only place in the country where you can buy high-end minimalist kitchens by Spanish brand Mobalco. 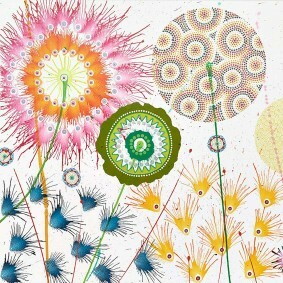 It also sells reasonably priced designs by Second Nature and Burbidge, alongside its own fully customisable line. Stop by the west London showroom of this kitchen brand to compare its handmade ‘Shaker’, ‘Artisan’, ‘Urban’, ‘Crème de la Crème’ and ‘Pure’ ranges, as well as freestanding larders and dining furniture. There are 14 further stores around the country. This luxury retailer has a strong presence in Scotland, with showrooms in Aberdeen, Perth, Edinburgh, Broxburn and Glasgow. It sells Leicht, Poggenpohl and Stoneham kitchens, and its own ‘KI Collection’. Superb architectural kitchens by Italian brand Elmar and the German-made Hacker are on display at this west London showroom. You’ll also spot high-tech appliances by Swiss brand V Zug. A trio of central London showrooms that promote the latest in contemporary Italian design, selling Ernestomeda and Lago kitchens, as well as bespoke creations with high-quality components. A full interior design service is available. Classic styling, clever storage ideas and competitive prices. For added simplicity, the British kitchen giant divides its collections into three broad ranges based on price: ‘Uniquely’, ‘Purely’ and ‘Simply’ are all available at more than 200 showrooms nationwide. is this company’s signature look. Seven showrooms sell its four collections. Contemporary style is the driving force at this London-based company, which presents its customers with 3D plans to aid the design process. Its latest kitchen is made using walnut, brass and marble, with leather-clad larder doors. Expect to find top-quality handleless kitchens, designed and made in Italy, finished with stone worktops and Dornbracht taps. This west London showroom is well worth a visit, whether you’re seeking a simple upgrade or a significant refurbishment. This brand’s beautiful kitchens range in style from classic to modern; visit the newest showroom in London’s Notting Hill to admire the full selection. The company also specialises in stone flooring, which you can see on display in branches across the UK. Clean-lined cabinetry, carefully planned living zones and expert installation. A key dealer for the high-quality Warendorf kitchens (developed by appliance manufacturer Miele) and Pronorm kitchens, it also has its own collection. A bespoke design company with showrooms in London, Knutsford, Edinburgh and Newcastle. Luxe details such as silver leaf splashbacks and accents of high-quality marble are signature motifs. Services here can be split into two broad categories – the ‘Design’ arm of the business is all about creating bespoke kitchens, while the ‘Solutions’ section offers ready-made models by top German brands. Founded in 1963, this family-run brand sells premium kitchens by Siematic alongside its own collection. 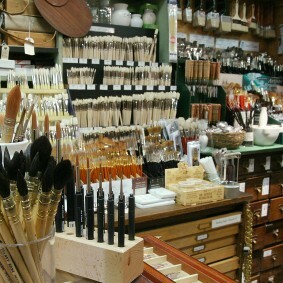 Displays promote the variety of finishes and colours on offer. 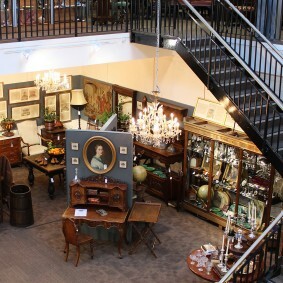 The flagship showroom is in London’s Marylebone. With 13 showrooms nationwide, including ones in Bournemouth and York, this British business designs and makes quality timber furniture. Its range of modern handcrafted kitchens – the warm oak ‘Henley’, Shaker-inspired ‘Suffolk’, elegant ‘Chichester’ and new pared-back ‘Limehouse’ – offers great value for money. Discover a wide array of German-engineered kitchens at this south London showroom, which is Pedini’s largest in Europe. New to its collection are the freestanding ‘Arts & Crafts’ units and ‘Materika’, which is beautifully crafted from exotic wood. a budget, check out its more affordable offshoot British Standard (see above). to showcase the revolutionary ‘P’7340’ design, created with Porsche Design. Promemoria Uber-luxe Italian furnishings are this company’s style. Its hero kitchen is ‘Angelina’, a customisable design that can be built using fine woods and stones, and finished with extras including wine storage. This prestigious Italian company opened its first stunning showroom in the UK last year. Visit now to explore a range of opulent, indulgent kitchens that feature rich metals, exotic timbers, unusual stone finishes and decorative marble. Find all four exquisite made-to-order kitchen ranges – ‘Classic’, ‘Urbo’, ‘Metro’ and ‘Shark’ – in finishes including concrete and metal at the flagship London showroom. There are six further stores across the south of England. Bespoke handmade kitchens crafted in Wiltshire and displayed in showrooms across the country – visit Thurloe Place to see the latest collections. The company designs a range of styles, from classic ‘19th Century’ to modern ‘Metropolitan’. This Oxfordshire showroom specialises in classic English kitchen and dining furniture. Choose from the Georgian-look ‘Brooklands’, heritage-inspired ‘Goodwood’ and Shaker-style ‘Silverstone’. Handmade in North Yorkshire for over 30 years, this brand’s kitchens are crafted using traditional mortise and tenon joints and feel individual thanks to a mix of new and reclaimed materials. The showroom is located next to the workshop. Tom Howley Elegant hand-painted bespoke kitchens, including the Shaker-style ‘Hartford’, which is the company’s best seller. You can view the designs in 13 showrooms. All furniture comes with a 10-year guarantee. Not only does this London showroom offer own-brand contemporary kitchens by two top Italian firms, Valcucine and Forza, it also deals in furniture and lighting, meaning you can put a whole scheme together in one place. Discover the latest kitchen trends at this Italian furniture company’s Chelsea showroom. Look out for the ‘Phoenix’ design, which offers handles in various lengths and 30 colour options – our pick is black elm and canaletto walnut. A second showroom can be found at Design Centre Chelsea Harbour. Select from 28 kitchen styles at this DIY chain, which has 230 UK showrooms. Colours are predominantly neutral to enable customers to update accessories easily, and a comprehensive installation service means everything from cabinetry to flooring can be taken care of.